Jon Spaihts’ script for Passengers has been circulating around Hollywood for years, going from studio to studio and being mentioned several times on the Black List, an annual look at the best unproduced screenplays. The good news is, it was finally picked up with A-list actors Jennifer Lawrence and Chris Pratt starring, and director Morten Tyldum coming on board fresh off his Oscar-nominated film The Imitation Game. The bad news is, it was picked up by Sony, who as of late has become a studio that increasingly makes clear that when it comes to film, they really have no idea what they’re really doing. Even worse, the completed film arrives to a pretty brutal backlash, particularly for one part of its plot that has understandably irked people the wrong way. But does that alter my own opinion of the film, or is it relatively miniscule in comparison to some of its other problems? The answer, if you haven’t figured out already, is the latter. If you’re not familiar with the concept, it’s set on an intergalactic ship that’s already deep in space, en route to a new planet named Homestead II. Since the journey lasts for 120 years, everyone from the passengers to the crew has been put in hibernation pods until they reach their destination. However, thirty years into the voyage, a small meteor collision causes a pod to malfunction and awaken its occupant, mechanic Jim Preston (Pratt), who of course isn’t very happy that he’s been waken up with ninety years left on the journey, and aside from android bartender Arthur (Michael Sheen) is completely and utterly alone. After a while, his loneliness becomes too much to bear, and against his better judgement he secretly causes another pod to “malfunction”, this time waking female writer Aurora Lane (Lawrence) to whom he had become fascinated by whilst she was still sleeping, and thus condemning her to the same fate as him, only this time with the hope of forming a connection with another human, and possibly even more. You can probably tell why this has alarmed some people already, especially as it seems to offer a one-sided romance with somewhat creepy undertones and a lead character whose actions make him a highly questionable and even unlikeable figure. In most aspects, it’s entirely understandable; the choice he makes in forcing this complete stranger into this situation along with him and effectively gas-lighting her into eventually falling for him is a very alarming one, and is something you would probably expect to see in a psychological horror than an endearing romance film like this. However, at the same time, the film KNOWS that this choice is an utterly terrible one, and at several points goes out of its way to highlight the severe consequences he has knowingly sentenced her to – and, in all honesty, that makes for an interesting watch. While I can’t say that his decision was the right one in any circumstance, the fact that there is a major dilemma at its heart makes it just a little more compelling than your average romance film, or even your typical sci-fi film. It likes to hint at its many repercussions, and explores the fallout of the situation when more secrets are revealed, directly addressing how much of a bad decision it was that he made. Though some may find these undertones uncomfortably creepy, and rightfully so, it still makes it a slightly more layered film than one may expect, and even in scenes that rely on the easy chemistry between the two stars, it’s more compelling because there is this real weight behind their pairing at all. The best part of the film is the first two-thirds, which is where this takes centre stage and makes it an interesting concept that’s being executed okay enough to make you wonder where this is all going to go. Where it DOES go, however, is where I personally take real issue with the film. Without going too much into spoilers, there are a few new reveals that nearly tear apart the film single-handedly, and replaces all of its intriguing build-up with what feels and even looks like a completely different film. It’s as though at some point during Spaihts’ script’s floating about in the Hollywood atmosphere, it was handed to one or two studio hack writers who took a look at the original script and thought, “you know what this really needs? An out-of-nowhere action finale!” That’s basically what it becomes in its final third act, in a real case of “one of these things is not like the other” where the tone, pacing, and even dialogue does NOT at all match with what came before it. Again, it’s impossible to go into without giving away spoilers, but when you see it you’ll be able to tell the minute that this film, which was up to this point actually doing a little better than expected, completely goes downhill. It’s a dumb, clichéd climax that doesn’t even have the luxury of being interesting, but even worse is how it completely throws away everything the film had been working towards, and leaves things to conclude in the most implausible and unbelievable of ways, as though the studio mutinied against Spaihts’ much more interesting concept, the very same one that got people’s attention in the first place, and spliced in a much more traditional Hollywood ending to counteract the actual challenging moments. Even if it was all Spaihts from the beginning, it’s the weakest possible way to end a film like this, which manages to rope you in with its flawed but nonetheless intriguing idea, but spits back out at you a lame sci-fi conclusion that we’ve seen in countless other big-budget sci-fi flicks like this one. Call it a studio’s butchering of an interesting script, or the product of what happens when a scribe writes himself into a corner, but Passengers has been denied the fully engrossing theatrical experience it very nearly was. Goddammit, Sony. 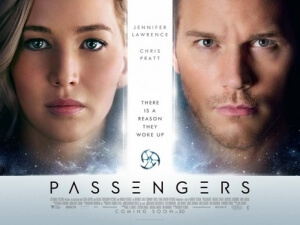 Passengers will understandably irk some audiences the wrong way with a flawed plot with creepy undertones, but personally it made for a much more interesting watch than a lot of other sci-fi films as of late, although a baffling third act that completely changes the tone of the movie threatens to undo all of its intriguing build-up.